Not helping these comparisons is Erdogan's similar facial structure and his endless vindictive actions against anyone who's hurt his feelings. Turkish law gives him considerable leeway to do this. Unfortunately, a small handful of countries have extended helping hands rather than middle fingers in response to censorship and/or prosecution demands. 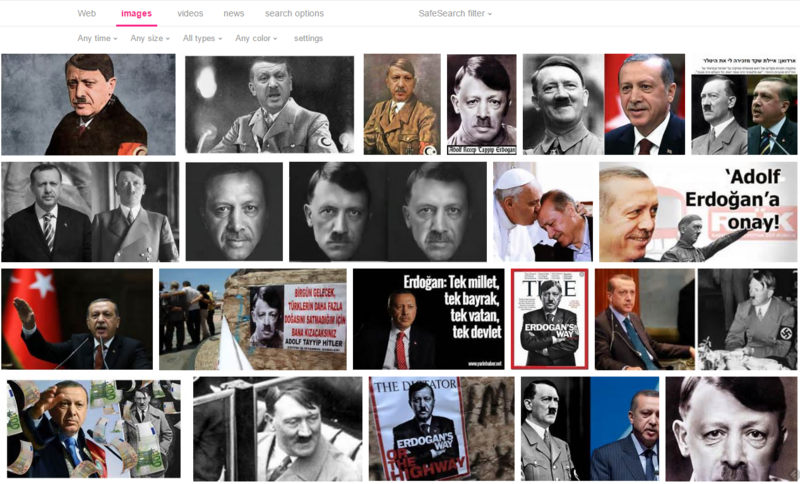 It's unknown why the Turkish government thought Google could help it out with an AOL image search, but it's equally unclear why it didn't ask for the delisting of Google's image search, which shows virtually-identical results. The more someone humors this tyrant, the worse he's going to get. And it certainly doesn't help that Jones' report comes on the heels of the Erdogan's US visit, during which his personal bodyguards beat up American protesters. This prompted a tepid display of disappointment from the US State Department and a much more hot-blooded demand for an apology from the Turkish government US law enforcement daring to interrupt Erdogan's bodyguards while they were beating up US citizens. The court order [PDF] contains a long list of sites likely worth visiting, if for no other reason than to stock up on Erdogan/Hitler memes to spread around the web. It's the circle of life, as lived by Erdogan and defined by Barbra Streisand. The more takedown notices sent by the Turkish government, the more the images and content spread… leading to more takedowns and more dissemination. If Erdogan wasn't so completely monomaniacal, he might realize the futility of his overseas efforts and content himself with jailing his constituents. Instead, he keeps engaging in internet turf wars with foreign governments, with very minimal success. ISPs like Google have stated they'll perform selective blocking in response to court orders, but honestly they shouldn't even be doing that. Not for someone like Erdogan -- an extremely powerful lout who appears to be shooting meme history by coming closest to the "literally Hitler" ideal. Once you start honoring take down orders, this is the inevitable result.